The blurry, dark little orbs crashed into me at racecar speed. Whop, whop, whop every second against my cotton hood. “Vai dentro!” Go inside, Luigi shouted from the top of the hill. I stepped deeper into the whirring mass. The thuds knocking me got stronger and there were more of them, but they weren’t aggressive; the bees were frenzied yet dazed, drunk from the honey they gorged on before leaving the hive, fixed on following their queen to a new home. In the bosom of thousands of beating gossamer wings, the vibrations were physically energising – like the invigorating collective ‘ommm’ of a packed yoga studio. I’d imagined myself having a Winnie the Pooh-like stint, inhaling chunks of honeycomb from my sticky palms and diving into still-warm, just-harvested honey. Instead, my three-week-long beekeeper training just happened to fall during peak swarming season, where there’s nary a drop of the sweet stuff in sight for us humans. It was April in southeast Sardinia – scorching sun, parched earth, whistling winds – but Luigi’s property boasted plenty by way of wild plants. Sturdy rosemary limbs, ground-clinging thyme, lanky lavender, woody thorned thistle, clusters of saffron corbezzolo (the fruit of the ‘strawberry tree’) and a field of white asfodelo flowers laid the foundation for his carefully crafted monofloral honeys. 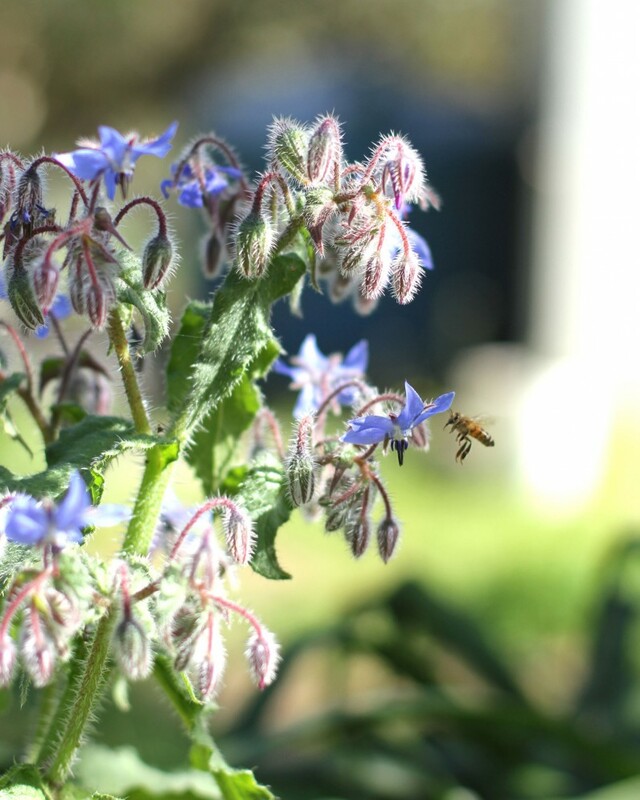 Luigi would place his beehives in a certain spot just when the desired plant had begun to blossom, harvesting the bees’ work at the close of the fioritura, the flowering. The technique makes for an array of distinctly flavoured honeys – say, the minty freshness that’s signature to dandelion honey, while eucalyptus honey has a mushroomy scent – ranging from champagne to amber to terracotta in colour, each offering up a syrupy fingerprint of one dominant plant nectar and pollen. But there’d be none of that deliciousness until at least June. If the summer months were to have any honey at all for harvesting, tracking and collecting swarms was the way to go. And whether a swarm happens or not depends on the almighty queen bee herself. 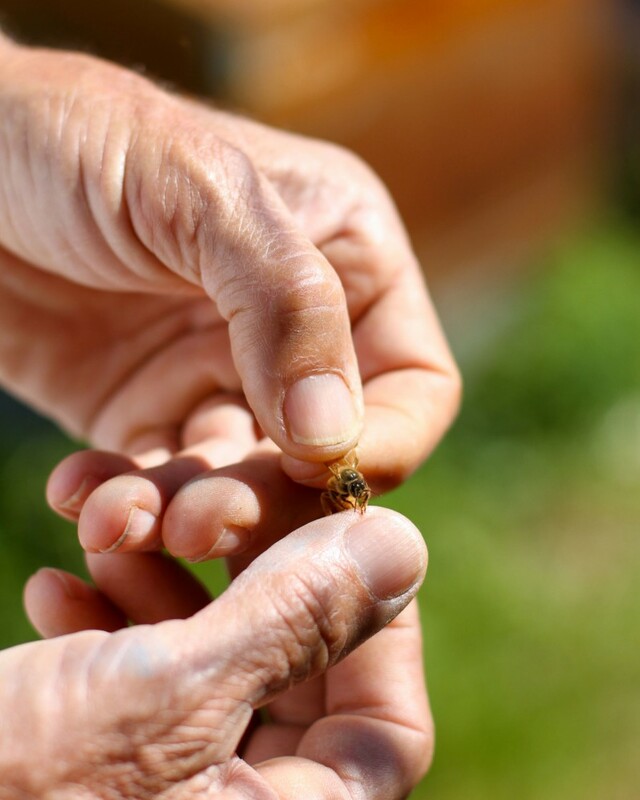 In springtime, once the flowers’ nectar starts to flow, a bee colony will become saturated with members, and starts to rear new baby queens in special queen cells. Just before a new queen hatches – there can only be one ruling each kingdom – the old queen flees the hive, taking around half the worker bees along with her (who, by the way, are all ladies, too, charged with foraging for nectar, cleaning the hive and building comb. The boys – AKA drones – do absolutely nothing except impregnate the queen, a task that kills them instantly – tough life). The swarm starts out as a murky cloud, quickly landing at a spot they’ve already scouted out a few days before. “Voglio mantenere le mie arnie forti,” said Luigi – I want to keep my hives strong. 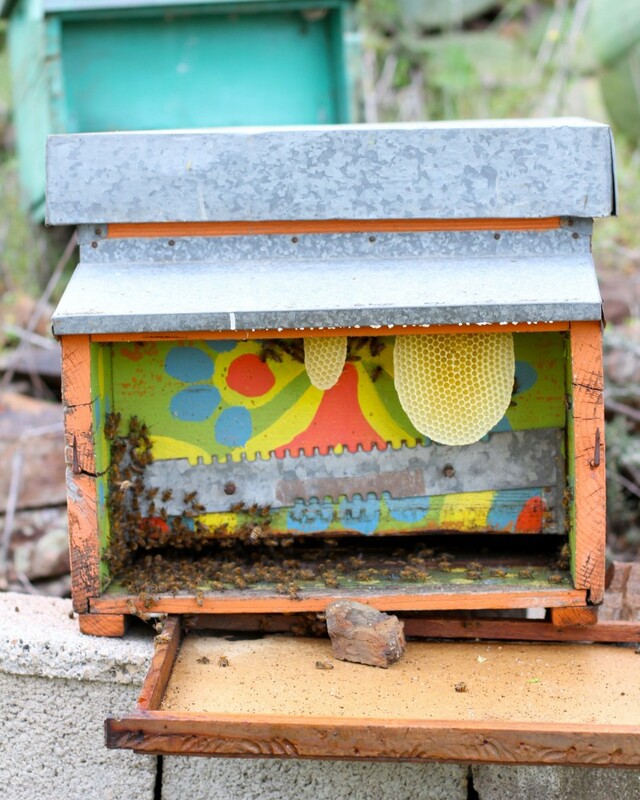 For a beekeeper, saying arrivederci to half your bees just before the honey harvest is bad news indeed, and those runaways need to be invited into an empty hive, stat. The key to beckoning a swarm away from the pergola or mail box they’ve taken a liking to is to capture the queen; the colony can’t function without her, and her scent summons them to follow. How to spot the elusive lady among tens of thousands of tightly packed, wriggling insects? Her body is longer than all the others. A sharp pair of eyes helps, too. 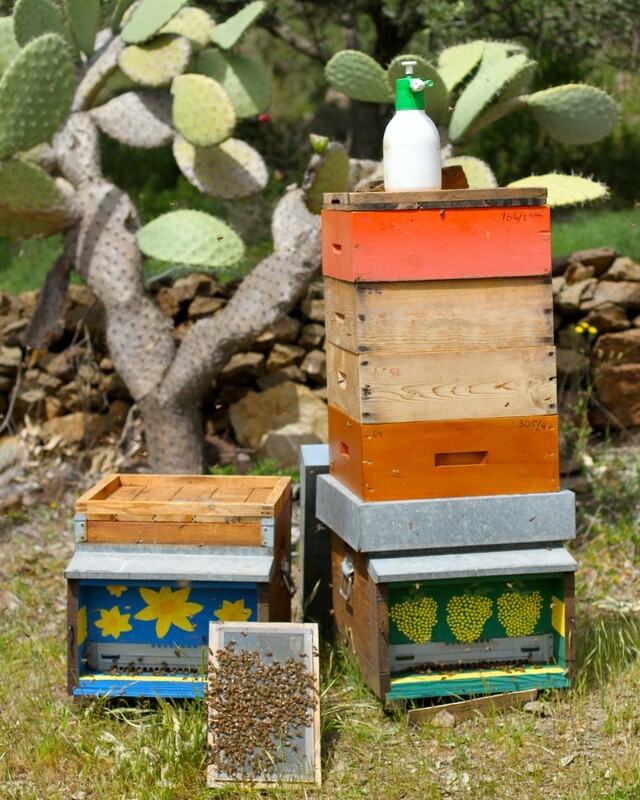 In order to keep abreast of the queens’ travel plans, we’d run a daily check of Luigi’s hundred-something hives. If a frame of comb had the bigger queen cells on them (they look like long, pointy cones, unlike the flatter, hexagonal cells where other bee larvae grow) we knew the bees were prepping to swarm. 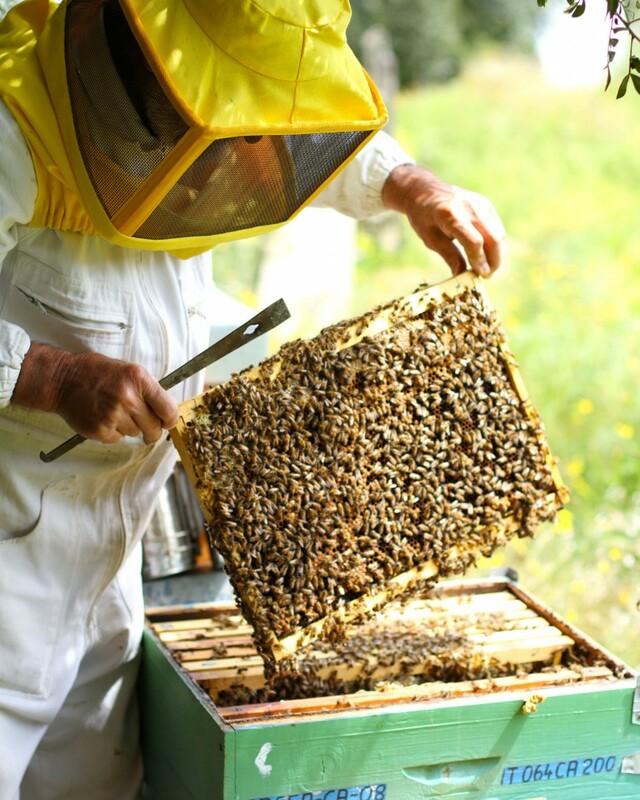 From sun up to evening, it was a slow and diligent process of gently opening each hive, checking each frame, and taking notes. By afternoon, there’d usually been at least one swarm floating across the horizon. They always seemed to interrupt our lazy lunch hour (I was most irritated when we were eating wild asparagus risotto, a signature dish of Luigi’s wife Fiorella, made with spindly purple spears collected from the field over the road). Any brief gap in conversation allowed the bees’ faint hum to come to the fore; we’d drop our forks, scan the landscape from the deck, and chase after them. Standing close by or even inside a swarm – only when wearing a beekeeper’s suit, of course – ran against rooted instruction. In Year 2, I sat on our front garden’s windowsill and got a rude shock on the bum from a defensive bee living underneath, no doubt fearing the incoming tush would soon crush her whole colony. If a swarm lands on or in your house, the threat of getting stung is certainly present, but with colony collapse disorder and mysterious bee deaths on the rise around the world, the little pollinators need all the protection and help they can get – best to call a local beekeeper to have them remove the swarm safely and give the bees a new, honey-yielding home. 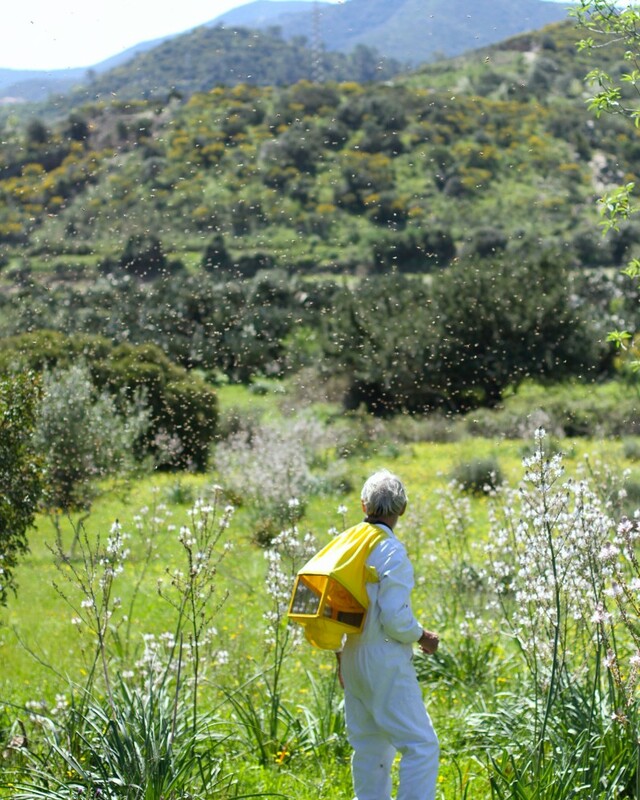 My hopes of honey guzzling during that schooling in Sardinia may have been quickly crushed, but watching Luigi calmly leaf through bees in search of their sovereign replaced any swarm panic with reverence – both for beekeepers and the bees’ passage. Fiorella and I watched him once, working upside down, balancing on a ladder while shaking bees off a branch they’d decided to cloak. “Non mi stanco mai di vedere gli sciami. La vecchia regina lascia spazio alla nuova regina. Questa è una bella cosa,” she said. I never tire of seeing the swarms. The old queen leaves to make space for the new queen. This is a beautiful thing. An excerpt from Wintering, by Sylvia Plath.